This website is designed to improve the ability of plant inspectors and diagnosticians to identify larval and adult Microlepidoptera that feed on Solanaceae. This tool includes both native species that have low economic importance and exotic species, established in the USA or not, that are quarantine significant. This tool focuses on taxa that occur in southeastern United States, primarily along the Gulf Coast from Florida to Texas. Although many of the species included in this tool are widely distributed, caution is needed if used to identify specimens outside this region. The tool includes an interactive identification key, images, fact sheets, and an illustrated glossary of terms. Microlepidoptera on Solanaceae is designed for professional insect diagnosticians and the general public. Domestic crop surveyors and identifiers are the primary intended client base, as well as APHIS-PPQ identifiers, members of the Plant Diagnostic Lab network, and members of U.S. state and local agencies. Foreign regulatory officials and users may find the tool useful as it covers several exotic species. Identifiers with the ability to dissect specimens will make the most effective use of the tool. For recipients of an identification done by a professional, the fact sheets provide further information about the biology and life history. Please read the Limitations for what the tool is not intended to cover. Lepidoptera that feed on solanaceous plants tend to be either polyphagous (feeding on many kinds of plants) or oligophagous (adapted to feed on Solanaceae). 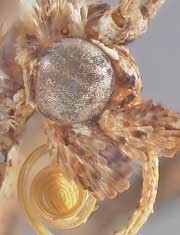 Polyphagous species are not considered in the tool, with the exception of Duponchelia fovealis. Specialist feeders on Solanaceae mostly belong to a few taxonomic groups that likely represent adaptive radiations on the plants. The present resource focuses mainly on two such groups: Gnorimoschemini (Gelechiidae) and the Leucinodes group of Spilomelinae (Crambidae). As such, the tool is a convenient nexus of taxonomic delimitation and commodity-based focus. The need for the tool is driven by the spread of certain pest species on the commodities of interest. Non-native species of economic importance include Leucinodes orbonalis, Neoleucinodes elegantalis, and Tuta absoluta. These species need to be distinguished from native or already established species that have varying levels of economic importance, ranging from pests to easily confused non-pests. The most recent list of pests on Solanaceae was compiled in 1949 (Anonymous, 1949). Several species are not covered in the keys by Weisman (1986) or Solis (1999). Comprehensive, comparative summaries about these species have not been previously published. Taxonomic revisions mostly focus on a single genus, and many have been outdated by the description of new species. Some of the included genera have not been revised at all. In the Gnorimoschemini, much pertinent information about taxonomy, morphology, and distribution was published by D. Povolný, but it is scattered among a large number of hard-to-find publications. Almost nothing comprehensive has been published on the Leucinodes group. The “Leucinodes group” is informally recognized herein. The Neotropical members were included in the “Udea group” of Spilomelinae in the checklist of Munroe (1995), but no diagnostic characters were given. The only two keys to Lineodes (Dyar 1913, Hampson 1913) were based only on wing pattern and were not illustrated; only Dyar (1913) includes all of the Nearctic species. Consequently, both of these taxa are subject to revisionary taxonomic research. Changes to scientific names are likely, including new combinations and synonyms. No new nomenclatural acts are proposed in this tool. Some species are part of cryptic species complexes, so the tool applies names conservatively. Not all of the described species of a genus are included, only those that fit the geographic and economic scope. Please see the limitations below for further caveats. For more information about taxonomic problems, see the genus fact sheets. Most of the species had not been genetically sequenced, or the identifications of sequenced specimens were questionable. Under the direction of Akito Kawahara and Lei Xiao (UF), project funding enabled sequencing of COI and (for a subset) EF1a for determined specimens. The sequences are available through GenBank (http://www.ncbi.nlm.nih.gov/genbank/). Thus, BLAST searches provide an alternative means of identification. The determinations achieved with this tool apply only to the species contained in the key and that have a fact sheet. There are several species of concern that are not included in this key. It is possible that a specimen of a similar, non-included species could be incorrectly identified as an included species. Conversely, the positive identification of a specimen as a non-included species must depend on other resources than this tool. For greater certainty, specimens should be compared to the species pages and, if available, authoritatively identified reference specimens. Supplementary information about related species, genera, and higher-level groups is contained in the fact sheets only for comparative purposes. The key includes information about the adult stage of 24 species and larval stage of 18 species. Some information about other life stages (eggs and pupae) is included in the fact sheets, but they are not scored in the key. Because some species are not scored for larvae, the limitations that concern species outside the scope of the tool also apply to the species for which larvae are not included. This key is intended primarily for domestic screening. It is not a comprehensive resource for CAPS screening. It may be used at Ports of Entry for species known to be intercepted at that locality, albeit with caution. Specimens identified as Tuta absoluta, Tecia solanivora, Leucinodes orbonalis, and Neoleucinodes elegantalis must be submitted to state or federal agricultural officials for confirmation. In addition, due to the large number of Symmetrischema species that are pests of solanaceous crops that are not known to occur in the U.S., it is advisable that specimens (especially adults) identified as Symmetrischema capsicum be occasionally submitted to state or federal agricultural officials for screening purposes.